Jupiter is at its brightest and best in the constellation of Libra, the Weighing Scales or Balance, this month. Its opposition, when it stands directly opposite the Sun, occurs on the morning of the 9th but it is prominent every night as it transits low across the south from the south-east at nightfall to the south-west before dawn. Venus, however, outshines it in the western evening sky and both Saturn and the increasingly striking Mars follow Jupiter into the southern morning sky. The Sun climbs another 7° northwards during May as Edinburgh’s sunrise/sunset times change from 05:29/20:52 BST on the 1st to 04:36/21:45 on the 31st. Because twilight is also lengthening, official darkness in the middle of the night lasts for under one hour by May’s end. The Moon is at last quarter on the 8th, new on the 15th, at first quarter on the 22nd and full on the 29th. Venus stands 20° high in the west at sunset, sinking to set in the north-west by 23:40 on the 1st and one hour later by the 31st. Brilliant at magnitude -3.9, it begins the month 6° above-right of Taurus’ brightest star, Aldebaran, and tracks east-north-eastwards between the Bull’s horns to end May in mid-Gemini, below Castor and Pollux. The young earthlit Moon makes an impressive sight almost 6° below-left of the planet on the evening of the 17th. Three days later, as Venus joins the region of sky covered by our chart, it passes 1.0° (two Moon-diameters) above-right of the star cluster M35 whose brightest stars may be glimpsed through binoculars from their distance of some 2,800 light years. Still on the far side of its orbit, Venus approaches from 217 million to 190 million km this month as its almost-full disk swells to 13 arcseconds in diameter. After dominating our winter nights, Orion ducks below our western horizon as the evening twilight fades at present. The Plough is overhead and Leo high in the south with its main star Regulus which has a close encounter with the first quarter Moon on the night of 21st/22nd. 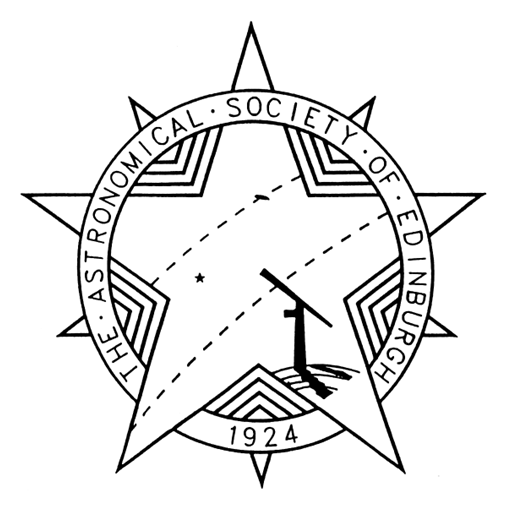 By our map times, Leo sis inking in the west and Jupiter is easily the most conspicuous object in the south though it stands barely 18° high for Edinburgh. 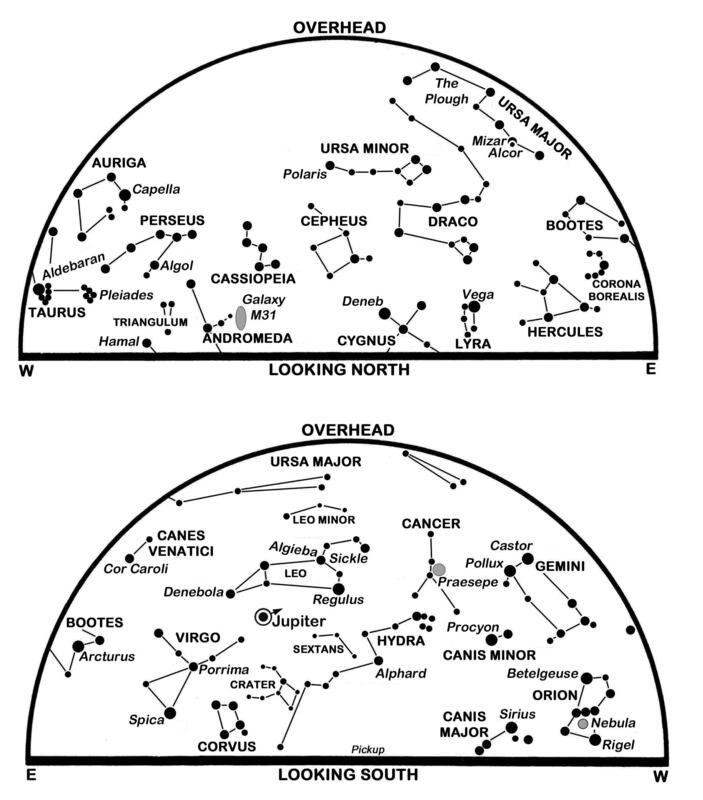 Moving westwards in Libra, it lies close to the Moon on the 27th. Its motion takes it from 4° east (left) of the well-known double star Zubenelgenubi at present to lie just 1.0° north-east of the star on the 31st. Jupiter is 658 million km away at opposition, shines at magnitude -2.5 and shows a 45 arcseconds wide disk through a telescope. Its two main darker cloud bands, its northern and southern equatorial belts, straddle a lighter equatorial zone. The famous Great Red Spot is gradually losing its status, however, being less than half as wide as it was a century ago and currently more salmon-pink in hue than red. It sits in a bay at the southern edge of the south equatorial belt and, like the many other Jovian cloud features, is carried smartly across the disk as the planet spins in just under ten hours. Steadily-held binoculars show the four main moons of Jupiter, Io, Europa, Ganymede and Callisto which change their configuration to the east and west of Jupiter from night to night, sometimes disappearing as they hide behind Jupiter or cross the disk, along with their shadows. If Jupiter’s low elevation makes telescopic views less than sharp, this is even more the case with Saturn which rises in the south-east at our map times and is 6° lower in the sky than Jupiter as it reaches the meridian just before dawn. Saturn improves from magnitude 0.4 to 0.2 as it creeps westwards above the Teapot asterism in Sagittarius. It lies 1,392 million km away at mid-month when its oblate globe is 18 arcseconds across set within 40 by 17 arcseconds rings that have their north face inclined at 26° to our view. Look for it 4° right of the Moon on the morning of the 5th. 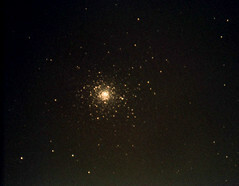 Less than 2° below Saturn is the globular star cluster M22, a ball of thousands of stars that lies about 10,600 light years away and formed some 12 billion years ago. 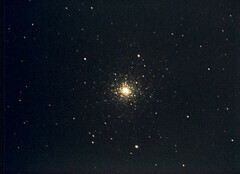 At about magnitude 5.1 and visible as a hazy glow through binoculars, it was the first globular to be discovered and is brighter than M13 in Hercules, the best globular in the northern sky. Mars lies almost 15° east of Saturn at present and rises at Edinburgh’s south-eastern horizon at 02:46 on the 1st. As it more than doubles in brightness, from magnitude -0.4 to -1.2, it also speeds 12° eastwards from Sagittarius to Capricornus so that by the 31st it rises at 01:31 and its fiery glow is unmistakable above the south-south-eastern horizon before dawn. Catch Mars below the Moon on the morning of the 6th. Telescopically, its disk swells from 11 to 15 arcseconds as its distance falls from 126 million to 92 million km. Its approach opens the optimum window for sending probes to the planet and NASA’s InSight lander to study “marsquakes” and the Martian interior is due for launch between 5 May and 8 June. 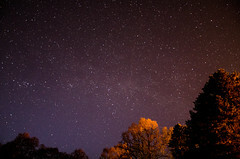 Meteors of the Eta-Aquarids shower, debris from Comet Halley, appear until the 20th as they radiate from a point that lies low in the east for an hour or so before dawn over Scotland. The shower peaks with some moonlight interference on the 6th and brings a fine shower for watchers further south but only a handful of meteors for us. This is a slightly revised version, with added diary, of Alan’s article published in The Scotsman on April 30th 2018, with thanks to the newspaper for permission to republish here. The Sun, now climbing northwards at its fastest pace for the year, crosses the equator of the sky at 04:30 GMT on the 20th, the time of our vernal equinox. It then rises due east and sets due west, and days and night are equal in length around the globe. The Sun’s progress means that our nights are falling rapidly later, an effect that appears to enjoy a step-change when we set our clocks forward to British Summer Time on the 27th, though, in this instance, the daylight we gain in the evening is lost in the morning. It is noticeable, too, that the stars at nightfall are shifting quickly to the west. Orion, for example, dominates in the south as darkness falls at present, but has tumbled well over into the south-west by the month’s end. The Plough is nearing the zenith at our map times and it is the squat figure of Leo the Lion and the prominent planet Jupiter that dominate our southern sky. Jupiter is edging westwards beneath Leo’s hindquarters and passes just below the fourth magnitude star Sigma Leonis over the first few days of the month. Above and to its left is Denebola, the Lion’s tail, while further west (right) is Leo’s leading star Regulus in the handle of the Sickle. 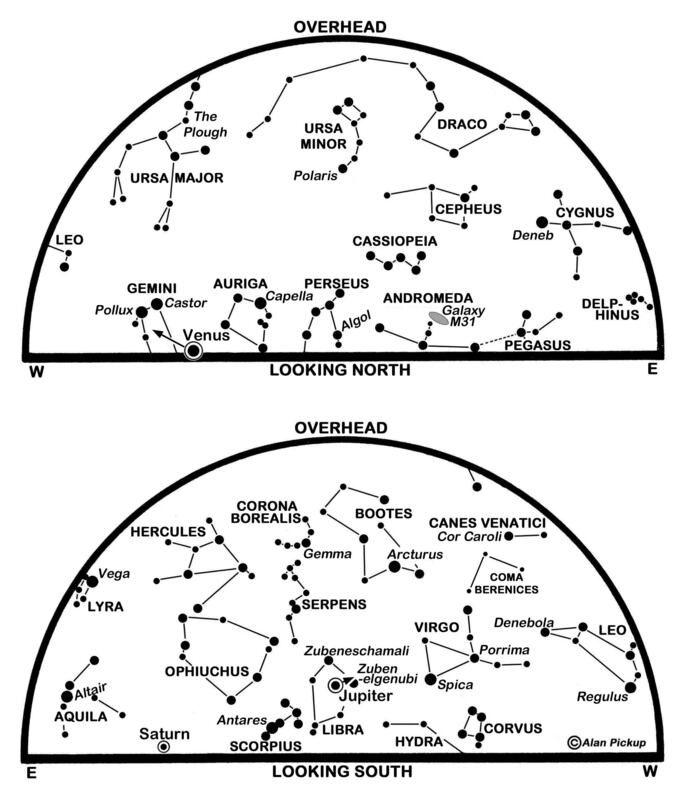 Algieba (see chart) appears as a glorious double star through a telescope. Jupiter comes to opposition on the 8th when it stands opposite the Sun so that it rises in the east at sunset and is unmistakable as it climbs through our south-eastern evening sky to pass 40° high on Edinburgh’s meridian in the middle of the night. Eleven times wider than the Earth and yet with a day lasting under ten hours, it is 664 million km distant at opposition and shines at magnitude -2.5, more than twice as bright as any star other than the Sun. View Jupiter through binoculars or a telescope, and the fun really begins. Binoculars show its four main moons, Io, Europa, Ganymede and Callisto, which change their relative positions to east and west of the planet’s disk from night to night as they orbit almost directly above the equator. Were it not for Jupiter’s glare, we could see all four of these with the naked eye. With numerous sulphurous volcanoes, Io is the most geologically active body we know, while Europa is the only one of the four to be smaller than our Moon and is thought to harbour a deep ocean of water beneath its icy crust. This makes it so irresistible as a potential home for life that the US Congress has urged NASA to add a lander craft to a planned mission to Europa over the next decade. The Jovian disk appears 44 arcseconds wide when we view it through a telescope at present. Even a small telescope shows its main cloud belts but the smaller cloud features that indicate Jupiter’s rotation are more of a challenge. The famous Great Red Spot in the southern hemisphere is a storm that has raged for at least 185 years but is now shrinking noticeably. By the time Jupiter is sinking in the west before dawn, the two brightest objects low in the south are Mars and Saturn. Mars stands 18° to the right of Saturn and is slightly the brighter of the two at present – their magnitudes being 0.3 and 0.5 respectively, with both of them outshining the red supergiant star Antares in Scorpius which lies more than 5° lower and between them. The Moon stands above-left of Mars on the 1st, above Saturn on the 2nd, and above and between them both on the 29th. This month Saturn improves only slightly to magnitude 0.4 and hardly moves in southern Ophiuchus, being stationary in position on the 25th. Mars, tracking eastwards from Libra to Scorpius, more than doubles in brightness to magnitude -0.5 as it approaches from 161 million to 118 million km. It also swells in diameter from 9 to 12 arcseconds and telescopes are starting to show surface features, including its north polar cap. There is no comparison, though, with the beauty of Saturn whose superb rings have their north face tipped Earthwards at 26°, near their maximum tilt, and stretch across 38 arcseconds. Saturn’s disk is 17 arcseconds wide and has much more subdued cloud belts than Jupiter. Although Venus is brilliant at magnitude -3.9, we have slim hopes of seeing it deep in our south-eastern twilight for just a few more mornings. Mercury, already lost from view, reaches superior conjunction on the Sun’s far side on the 23rd. The sunrise/sunset times for Edinburgh change from 07:03/17:48 GMT on the 1st to 06:45/19:50 BST (05:45/18:50 GMT) on the 31st. The Moon is at last quarter on the 1st, new on the 9th, at first quarter on the 15th, full on the 23rd and at last quarter again on the 31st. New moon on the 9th brings the first and best of this year’s four eclipses when a total eclipse of the Sun occurs along a path that travels eastwards across Indonesia before swinging north-eastwards over the Pacific to end to the north of Hawaii. Surrounding areas enjoy a partial eclipse but there is nothing to see from Europe. The Moon slims the outer and lighter shadow of the Earth during a penumbral lunar eclipse on the 23rd. Also best seen over the Pacific, it is partly visible from most of the Americas and eastern Asia, but only a minor fading of the southern part of the Moon may be expected. This is a slightly-revised version of Alan’s article published in The Scotsman on March 1st 2016, with thanks to the newspaper for permission to republish here. Journal Editor’s apologies for the lateness of the article appearing here.